I was minding my own business, trying to get some stuff done on the computer tonight and I received an e-mail with a note saying that I had been ‘tagged’ by Mud Ranch – thanks! Tag 7 people and link to them – I don’t have 7, so hopefully the world doesn’t end. 1. I really don’t like chocolate – I know it’s a sin! 2. I am the oldest of six children. 4. I don’t like the rain. Why do I live in Oregon? Good question! 6. I used to think sheep were stupid and NEVER in a million years did I think I would be raising them and loving it. And to the unfortunate people that I feel comfortable taggins – sorry: Meridian Jacobs, Patchwork Jacob Sheep, Checkers, Mountain Dweller. Thanks for the tag. I’ll give it some thought, although limiting it to ONLY 7 weird things about me might be difficult! 😀 Good job. 😉 I like a ’67 Camaro myself… too much of a gas guzzler though… and I HATE showers too, even my own baby shower. I wanted to make a “Drive Thru Shower” where they pass a gift out the window and we give them a piece of cake. I thought that was an excellent idea! I love the “Drive Thru Shower” idea! 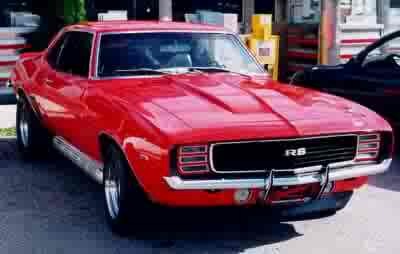 I’m old enough to have once owned a ’67 Camero when it was only about 6 years old! Gold with a black stripe across the front. An ex-significant other thought it was smart to get rid of it and buy a Toyota Celica. Darn. I wish I had that Camero to give to my daughter… or maybe not.